Their invention inspired by a team member's 87-year-old aunt, four Boston College students placed second in the inaugural Microsoft Windows ChallengE, held March 19–21 at Microsoft's Redmond, Washington, campus. 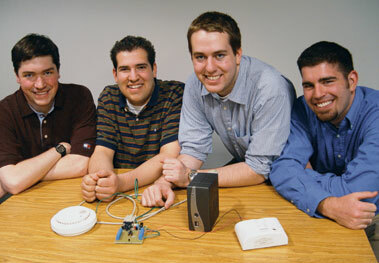 Juniors Andrew Logan, Greg Pavlov, and Joel Barciauskas, and sophomore Daniel Scali, all computer science majors, received $3,000—and $1,000 for the University—for their design of an inexpensive home sensor, dubbed Assist, that checks for unusual heat fluctuations, smoke, and carbon monoxide. When a dangerous change is detected Assist, which runs on a rewired computer the size of a paperback copy of War and Peace, e-mails or sends a cell-phone text message to someone outside the home. Logan's great-aunt Hermina inspired the project. "She wanted to keep her independence," says Logan. Assist allows seniors to live alone knowing "someone will know if something goes wrong" or "if they accidentally leave the stove on." The competition required students to create a device on the theme "Making the World a Safer Place." The group worked on the project for a year. Computer science lecturer William Ames, formerly an engineer at Hewlett-Packard, helped develop the $264 prototype. Associate Professor Robert Signorile was the team's advisor. The students made improvements to Assist until days before the competition. "We never really got the chance to test out the carbon monoxide detector," says Barciauskas. "We didn't want to blow up our prototype," explains Pavlov. Twenty-nine teams, representing 21 universities from across the United States, participated in the competition.